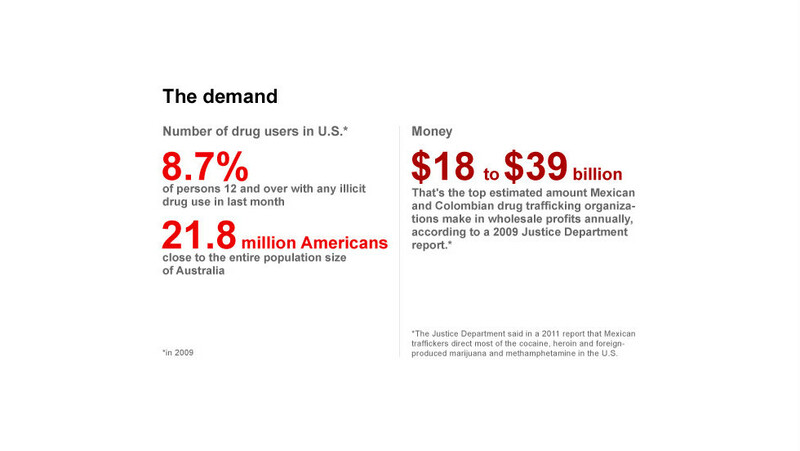 (CNN)Here's a look at the Mexican Drug War. 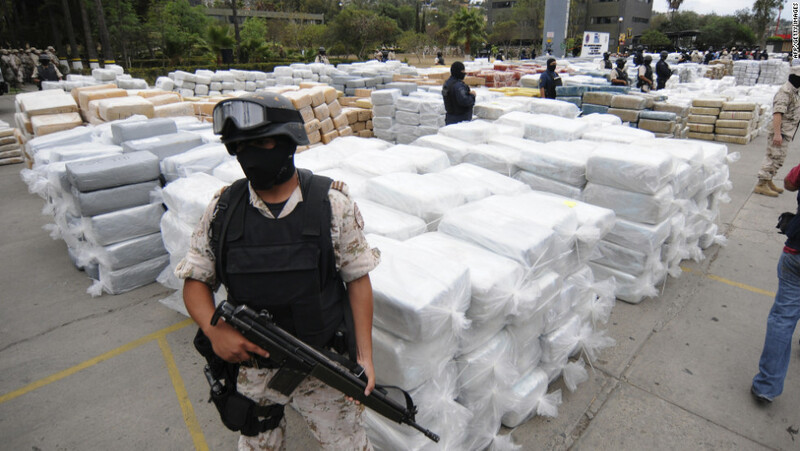 The Mexican government has been fighting a war with drug traffickers since December 2006. At the same time, drug cartels have fought each other for control of territory. More than 60,000 people have been killed from 2006 to 2012 due to drug-related violence, during former Mexican President Felipe Calderon's six-year administration, according to Human Rights Watch. During that same six-year period, 26,121 people have gone missing in Mexico, though authorities don't have data about how many of the disappearances are connected with organized crime. Since December 1, 2012, when Enrique Peña Nieto assumed the presidency, overall intentional homicide numbers have declined slightly, but the number of reported kidnappings continues to climb. There are approximated 6,700 licensed firearms dealers in the United States, along the U.S.-Mexico border. There is only one legal firearms retailer in Mexico. 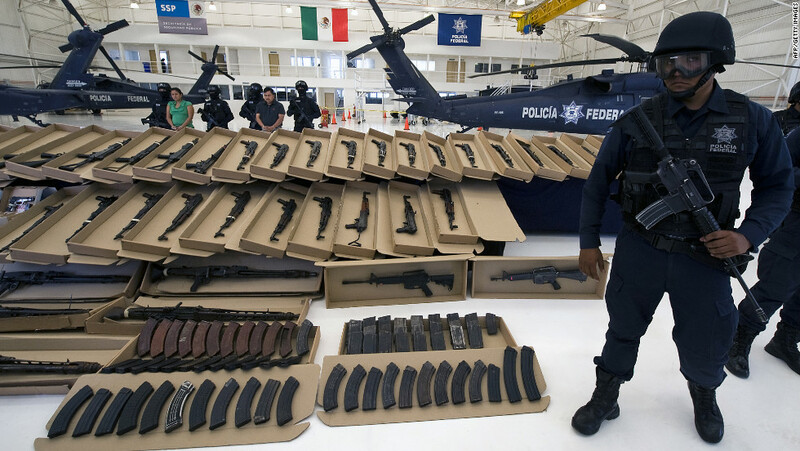 Nearly 70% of guns recovered from Mexican criminal activity from 2007 to 2011, and traced by the U.S. government, originated from sales in the United States. Ninety percent of the cocaine that enters the U.S. transits through Mexico. Mexico is also a main supplier of marijuana and methamphetamines in the U.S.
Mexican drug cartels take in between $19 and $29 billion annually from U.S. drug sales. Beltran Leyva - Founded by the four Beltran Leyva brothers, Arturo, Carlos, Alfredo and Hector. Formerly aligned with the Sinaloa cartel, now aligned with Los Zetas against the Sinaloa, Gulf and La Familia Michoacana cartels. Gulf Cartel - Based in Matamoros, Tamaulipas. Formerly one of the most powerful cartels. Juarez Cartel - Formerly aligned with the Sinaloa Cartel, now fighting it for control of Ciudad Juarez and the state of Chihuahua. La Familia Michoacana - Based in the Michoacan state. Possibly defunct as of 2011. Los Zetas Cartel - Comprised of former elite members of the Mexican military. Initially they worked as hit men for the Gulf Cartel, before becoming independent. They now battle the Gulf cartel for control of Tamaulipas and Nuevo Leon. 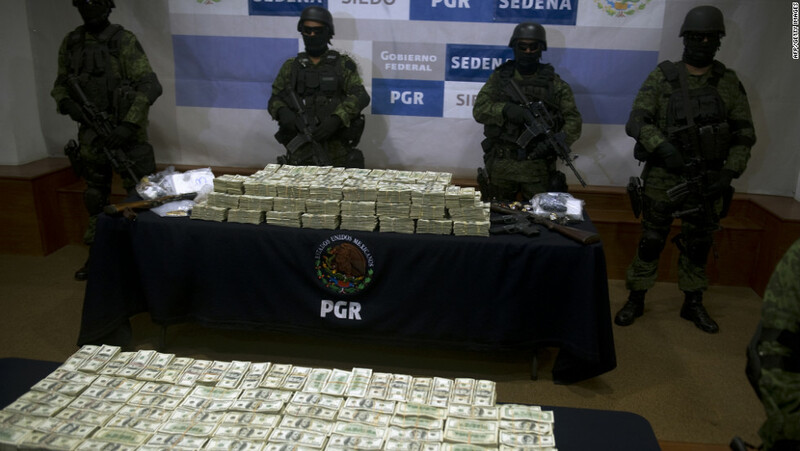 Sinaloa Cartel - Considered to be the dominant drug trafficking organization in Mexico. 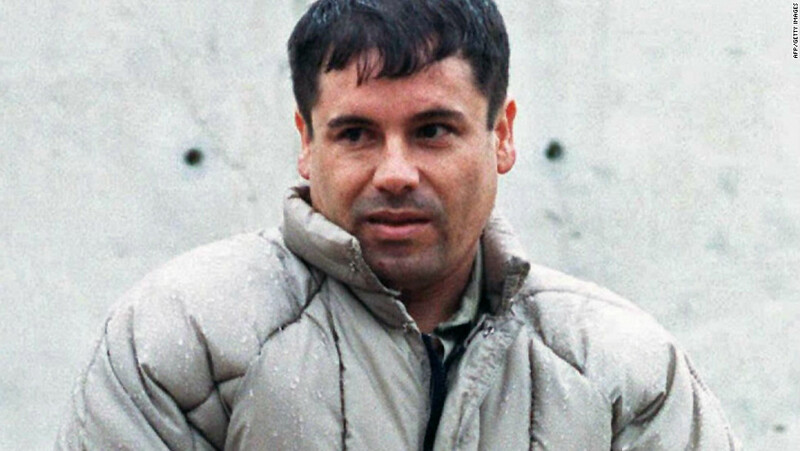 Led byJoaquin "El Chapo" Guzman. Tijuana/Arellano Felix Cartel - Based in Tijuana. Most of the Arellano Felix brothers have been apprehended or killed. August 16, 2006 - Javier Arellano Felix, alleged head of the Tijuana cartel, is arrested on a fishing boat off the Baja peninsula. December 11, 2006 - Newly elected Mexican President Felipe Calderon deploys more than 6,500 Mexican soldiers to the state of Michoacán to battle drug traffickers. January 2007 - Captured drug lord Osiel Cardena Guillen, alleged former head of the Gulf cartel, is extradited to the United States. February 2007 - More than 20,000 Mexican soldiers and federal police are spread out across Mexico as part of President Calderon's drug war. 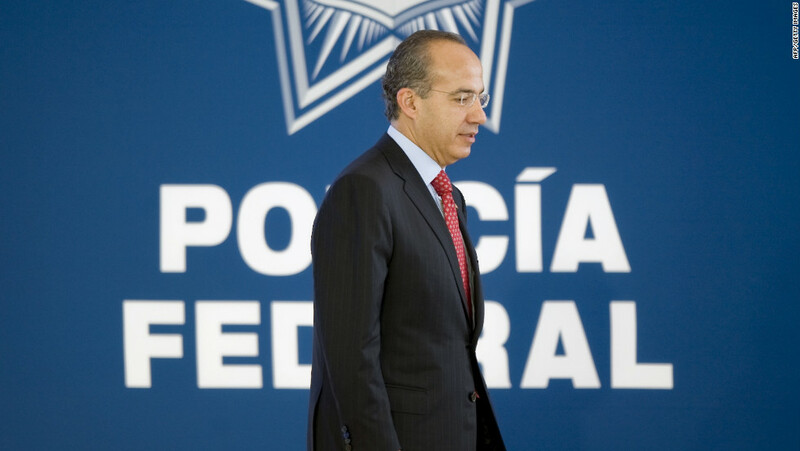 June 25, 2007 - Mexican President Felipe Calderon fires 284 federal police commanders to weed out corruption. January 2008 - Alfredo Beltran Leyva, of the Beltran Leyva Cartel, is arrested by Mexican police in Culiacan, Sinaloa, Mexico. May 1, 2008 - Roberto Velasco Bravo, Mexico's director of investigation for organized crime, is killed in Mexico City. May 8, 2008 - Edgar Eusebio Millan Gomez, Mexico's federal police chief, and two bodyguards are killed in Mexico City. May 9, 2008 - The commander of Mexico City's investigative police force, Esteban Roble Espinosa, is killed outside his home. September 15, 2008 - During an independence day celebration in Morelia's town square, grenades are thrown into the crowd, killing eight people. The incident has been described as the first terrorist-style attack on innocent bystanders in Mexico's drug war. November 1, 2008 - The acting head of Mexico's Federal Police, Victor Gerardo Garay, resigns under suspicion of corruption. November 3, 2009 - The reported head of the Los Zetas drug cartel, Braulio Arellano Dominguez, is killed in a gun battle with Mexican forces in Soledad de Doblado. December 16, 2009 - Arturo Beltran Leyva, head of the Beltran Leyva cartel, is killed in a shootout with Mexican forces in Cuernavaca. January 2010 - Carlos Beltran Leyva is arrested by Mexican authorities in Sinaloa. He is the third Beltran Leyva cartel brother to be captured or killed in two years. February 25, 2010 - Osiel Cardenas Guillen, head of the Gulf Cartel until his capture in 2003, is sentenced in Texas to 25 years in prison. He also is forced to turn over $50 million to the United States. May 26, 2010 - Pedro Roberto Velazquez Amador, allegedly the leader of the Beltran Leyva cartel in San Pedro, is killed in a shootout with federal forces in northern Mexico. June 11, 2010 - Edgar Valdez Villarreal, "La Barbie," an American citizen, is charged with trafficking thousands of kilograms of cocaine into the United States between 2004 and 2006. He remains a fugitive with a $2 million reward for information leading to his capture. June 25, 2010 - A leader in the Sinaloa cartel, Manuel Garibay Espinoza, is arrested in Mexicali, by Mexican police. July 29, 2010 - Ignacio "Nacho" Coronel Villarreal, one of the leaders of the Sinaloa drug cartel, is killed in a military raid in Guadalajara's suburbs. August 25, 2010 - The bodies of 72 migrants from South and Central America are discovered on a ranch in Tamaulipas state. It is believed the 58 men and 14 women were kidnapped by the Los Zetas cartel and killed for refusing to traffic drugs. August 30, 2010 - Mexican authorities announce that they have captured alleged drug lord Edgar Valdez Villarreal, alleged head of the Beltran Leyva cartel. American-born Valdez is known as "La Barbie" because of his blue eyes and light complexion. 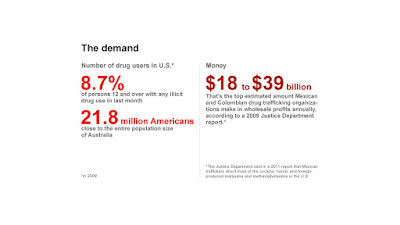 September 10, 2010 - Mexican President Felipe Calderon tells CNN en Español, "We live next to the world's largest drug consumer, and all the world wants to sell them drugs through our door and our window. And we live next to the world's largest arms seller, which is supplying the criminals." September 12, 2010 - A top leader in the Beltran Leyva cartel, Sergio Villarreal, is arrested in the city of Puebla. November 5, 2010 - Antonio Ezequiel Cardenas Guillen, aka Tony Tormenta, allegedly the head of the Gulf cartel, is killed in a shootout with Mexican forces in Matamoros. December 2010 - Mexico's Attorney General Arturo Chavez Chavez announces a death toll of 30,100 people in Mexico's four-year drug war. January 2011 - The Mexican government releases a revised death toll of 34,612 citizens killed during the four-year drug war. January 17, 2011 - Flavio Mendez Santiago, one of the original founders of Los Zetas, is captured near Oaxaca. February 15, 2011 - U.S. Immigration and Customs Enforcement Agents Jaime Zapata and Victor Avila, Jr. are run off the road in Mexico and attacked by a group of armed men who open fire. Zapata dies and Avila survives a gunshot wound to his leg. The Los Zetas drug cartel is suspected. February 23, 2011 - Mexican soldiers arrest six members of the Los Zetas drug cartel, including Julian Zapata Espinoza, who is allegedly responsible for the death of U.S. ICE Agent Jaime Zapata. March 5, 2011 - Alleged Los Zetas drug cartel member, Mario Jimenez Perez, is arrested in connection with Jamie Zapata's murder. March 7, 2011 - Alleged Los Zetas drug cartel leader, Marcos Carmona Hernandez, is arrested. March 31, 2011 - Mexico's Attorney General Arturo Chavez Chavez resigns, for personal reasons. 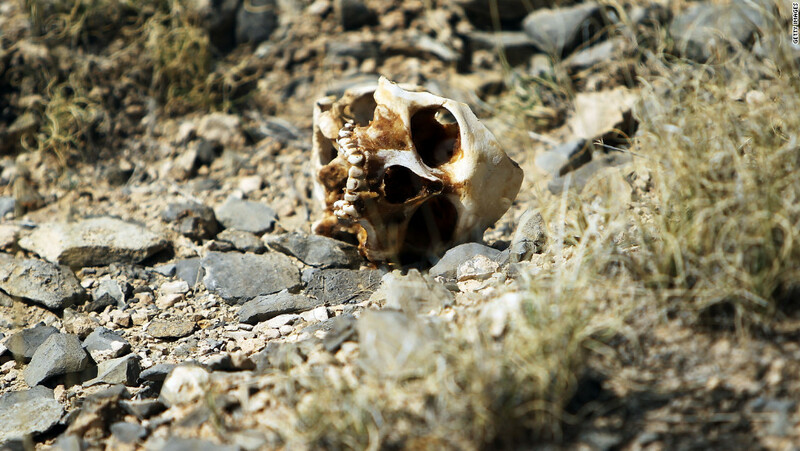 April 2011 - Several mass graves holding 177 bodies are discovered in Tamaulipas, the same area where the bodies of 72 migrants were discovered in 2010. April 16, 2011 - Mexican authorities announce the arrest of Martin Omar Estrada Luna -- nicknamed "El Kilo," a presumed leader of the Los Zetas drug cartel in San Fernando. Estrada Luna has been identified by authorities as one of three prime suspects behind the mass graves discovered earlier in April 2011. April 29, 2011 - Former drug cartel leader Benjamin Arellano Felix is extradited to the United States. May 8, 2011 - Twelve suspected members of the Los Zetas drug cartel and a member of Mexico's navy are killed in a shootout on a Falcon Lake island, after troops patrolling the area spot a camping area on the island. The suspected drug traffickers were storing marijuana on the island to be transported by boat to the U.S., authorities said in a statement. May 29, 2011 - In Hidalgo, 10 police officers, including a police chief, are arrested on charges of protecting the Los Zetas drug cartel. 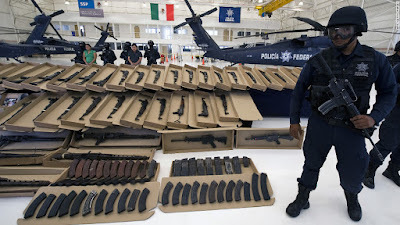 June 14, 2011 - A congressional report shows that more than 70% of firearms seized by Mexican authorities, and submitted to the ATF for tracing, are shown to have originated in the United States. The report covers 29,284 firearms submitted in 2009 and 2010. June 21, 2011 - Mexican federal police capture Jose de Jesus Mendez Vargas, also known as "The Monkey," the alleged head of La Familia Michoacana cartel in Augascalientes. July 3, 2011 - Mexican authorities arrest Jesus Enrique Rejon Aguilar, known as "El Mamito," a reported founding member of the Los Zetas Cartel and allegedly connected to ICE Agent Jaime Zapata's death. July 11, 2011 - The U.S. government announces a plan to require gun dealers in California, Arizona, New Mexico and Texas to report the sales of semiautomatic rifles under certain conditions in an effort to stem the flow of guns to Mexican drug cartels. July 27, 2011 - Edgar Jimenez Lugo, known as "El Ponchis" or "The Cloak," a 14-year-old American citizen with suspected drug cartel ties, is found guilty of beheading at least four people and sentenced to the maximum for a juvenile, three years in a Mexican correctional facility. July 30, 2011 - Mexican authorities announce they have Jose Antonio Acosta Hernandez, or "El Diego," in custody. He is the purported leader of La Linea, the suspected armed branch of the Juarez drug cartel, and considered responsible for the death of U.S. Consulate employee Lesley Enriquez and her husband Arthur Redelfs. 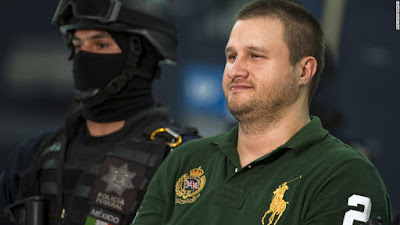 August 1, 2011 - Mexican federal police arrest Moises Montero Alvarez, known as "The Korean," a suspected leader of the Independent Cartel of Acapulco (CIDA) and allegedly connected with the murders of 20 Mexican tourists in 2010. 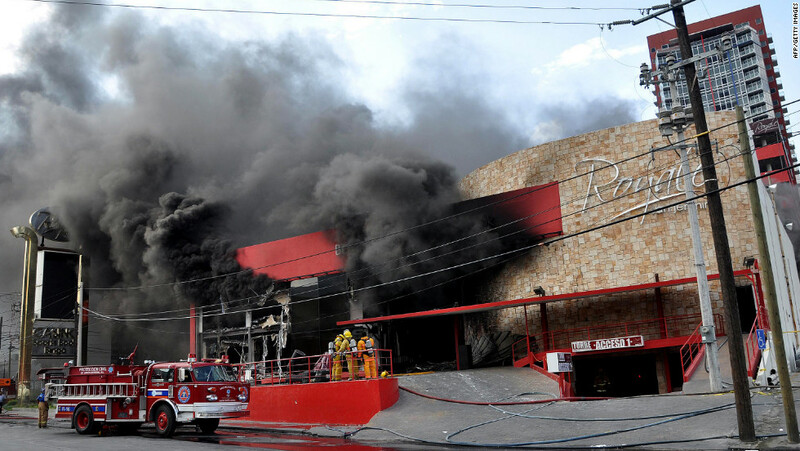 August 25, 2011 - At least 52 people are killed in an attack on the Casino Royale in Monterrey, Mexico. Witnesses told investigators that up to six people entered the Casino Royale and demanded money from the manager, according to Adrian de la Garza, the state attorney general for Nuevo Leon. When the manager refused to pay they set the building on fire, he said. August 30, 2011 - Mexican officials allege that the five suspects arrested in connection with the Mexico casino fire are members of the Los Zetas drug cartel and had targeted the owners of the casino for not complying with extortion demands. The suspects are identified as Luis Carlos Carrazco Espinosa; Javier Alonso Martinez Morales, alias "el Javo;" Jonathan Jahir Reyna Gutierrez; Juan Angel Leal Flores; and Julio Tadeo Berrones, alias "El Julio Rayas." September 1, 2011 - A Nuevo Leon state police officer, Miguel Angel Barraza Escamilla, is arrested in connection with the casino fire that killed 52 people in Monterrey. September 13, 2011 - A murdered man and woman are found hanging from a bridge in Nuevo Laredo. Near their mutilated bodies is a sign saying they were killed for denouncing drug cartel activities on a social media site. The sign also threatens to kill others who post "funny things on the Internet." September 20, 2011 - At least 35 bodies are dumped in a roadway in the coastal state of Veracruz, during rush hour. September 23, 2011 - Mexican authorities find another 11 bodies in locations throughout Veracruz. September 27, 2011 - Five severed heads are found in a sack near an elementary school in Acapulco. October 4, 2011 - The U.S. Drug Enforcement Administration (DEA) estimates that almost 43,000 people have died in Mexico's drug war since Mexican President Felipe Calderon took office in December 2006. October 6, 2011 - In an online video purporting to be from the Anonymous hacking group, a masked man threatens to release information about the Los Zetas drug cartel for allegedly kidnapping an Anonymous member. October 7, 2011 - The Mexican navy announces that it has arrested eight people suspected of involvement in the deaths of 67 people in Veracruz in recent weeks. October 12, 2011 - A suspected top Los Zetas drug cartel leader, Carlos Oliva Castillo, alias "La rana," or frog, is arrested for allegedly ordering the attack and arson at the casino that killed 52. November 24, 2011 - Mexican authorities find 26 bodies inside three abandoned vehicles in Guadalajara, Mexico, one day after authorities in Sinaloa state found 16 charred bodies inside two trucks that had been set ablaze. January 4, 2012 - Benjamin Arellano Felix, a former leader of Mexico's Tijuana drug cartel, pleads guilty to charges of racketeering and conspiracy to launder money. The plea deal calls for the forfeiture of $100 million to the U.S. and a maximum of 25 years in prison. 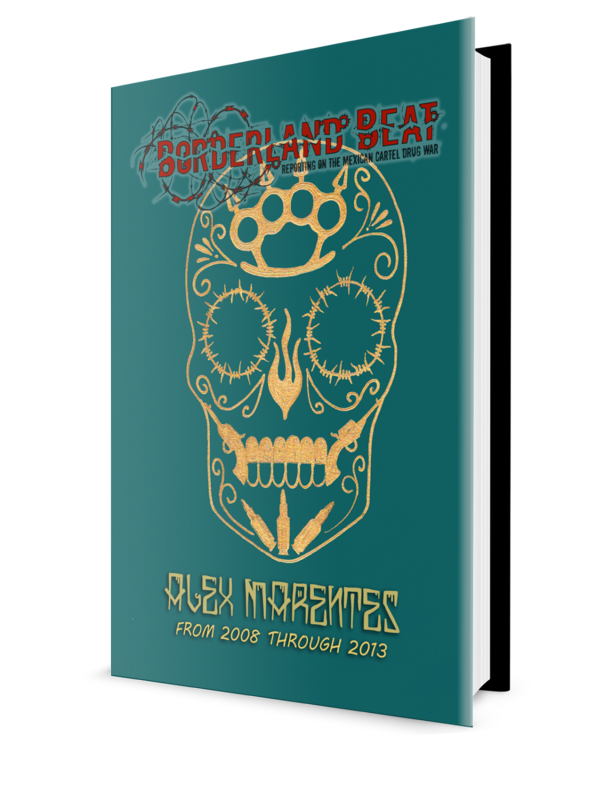 January 11, 2012 - The office of Mexico's Attorney General releases a statement saying that nearly 13,000 people were killed in drug violence between January and September 2011. 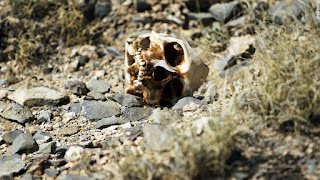 This pushes the death toll from December 2006 to September 2011 to a minimum of 47,000 people killed. April 2, 2012 - Former Tijuana cartel leader Benjamin Arellano Felix is sentenced to 25 years in prison and ordered to forfeit $100 million after pleading guilty to racketeering and conspiracy to launder money. April 24, 2012 - Using Calderón's strategy of using the army to fight the cartels, the Mexican government has killed more than 40 major cartel members. May 13, 2012 - Mexican authorities find at least 49 decapitated and dismembered bodies along a highway in Nuevo Leon state, between the cities of Monterrey and Reynosa. July 7, 2012 - In an interview with CNN, Mexico's President-elect Enrique Peña Nieto calls for a new debate on the drug war and says the U.S. must play a prominent role. 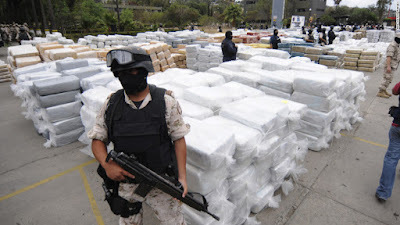 July 12, 2012 - A U.S. Senate Foreign Relations Committee report concludes Mexico's frontal assault against drug cartels has been "largely ineffective" and in some instances counterproductive to reducing violence. The report recommends the focal point of Mexico's anti-drug cooperation should be training and institution-building in police forces and judiciary. August 31, 2012 - Eduardo Arellano-Felix, an alleged senior member of a Tijuana-based drug cartel, is extradited from Mexico to the United States. Arellano-Felix was arrested on October 25, 2008, after a gun battle with Mexican forces. September 3, 2012 - In his final state of the nation address, Mexican President Felipe Calderon defends his government's approach to combating crime and drugs and criticizes the United States for providing criminals with almost "unlimited access" to weapons. September 4, 2012 - Mexican authorities announce the capture of Mario Cardenas Guillen, also known as "M1" and "The Fat One," a suspected leader of the Gulf cartel. September 27, 2012 - Mexican marines capture and arrest a man claiming to be Ivan Velazquez Caballero, alias "El Taliban." Velazquez Caballero is one of the top leaders of Los Zetas. October 9, 2012 - Mexican authorities confirm that Mexican marines killed Heriberto Lazcano Lazcano, leader of the Zetas cartel, in a shootout on October 7. Lazcano's body was stolen from a funeral home on October 8, but authorities had already taken fingerprints and photographs to confirm his identity. December 1, 2012 - Mexican President Enrique Peña Nieto takes office. 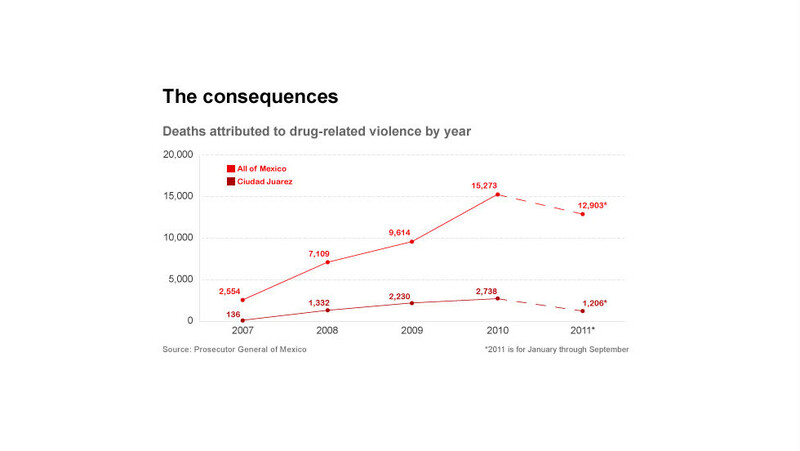 February 21, 2013 - A report published by Human Rights Watch criticizes Mexican security forces and estimates more than 60,000 people were killed in drug-related violence from 2006 to 2012. July 15, 2013 - Los Zetas cartel leader Miguel Angel Trevino Morales, known as Z-40, is detained by Mexican authorities in an operation in the Mexican border state of Tamaulipas, state media reports. August 20, 2013 - Mario Armando Ramirez, ranking member of the Gulf cartel and also known as X-20, is captured in Reynosa, near Texas. August 20, 2013 - Eduardo Arellano-Felix is sentenced to 15 years in U.S. federal prison for his role as CFO in the drug cartel organization. February 22, 2014 - A U.S. official tells CNN that Joaquin "El Chapo" Guzman, the boss of one of Mexico's most powerful drug trafficking operations, has been arrested in Mexico. March 9, 2014 - Cartel leader Nazario Moreno Gonzalez, also known as "El Chayo," "El Doctor" and "El Mas Loco," The Craziest One," is fatally shot during an arrest attempt, according to Mexican authorities. He was one of the leaders and main founders of La Familia Michoacana cartel. This is the second time Mexican officials said Moreno is dead. They announced in 2010 that they had killed him. September 26, 2014 - Gunmen open fire at buses carrying students and soccer players in southern Mexico. Authorities say three students are among six people killed in the violence, and 43 students remain missing. October 1, 2014 - Mexican police capture Hector Beltran Leyva, head of the Beltran Leyva drug cartel, in San Miguel de Allende, Mexico. October 9, 2014 - Authorities announce that Mexican federal police have captured alleged Juarez Cartel boss Vicente Carrillo Fuentes. January 27, 2015 - Mexican Attorney General Jesus Murillo Karam says there is "legal certainty" that the 43 college students who went missing four months ago in the Mexican state of Guerrero were murdered. Mexican authorities believe it was a case of mistaken identity. Former Iguala Mayor Jose Luis Abarca has been charged in the case and is awaiting trial as the accused mastermind of the abduction and execution of the 43 students. February 27, 2015 - Servando Gomez, leader of the Knights Templar drug cartel, is detained by Mexican authorities in the state of Michoacan. March 4, 2015 - Zetas drug cartel leader Omar Trevino Morales is apprehended by Mexican authorities in a suburb of Monterrey. Five others are arrested in a simultaneous operation. July 11, 2015 - Drug kingpin Joaquin "El Chapo" Guzman escapes through a hole in the shower area of his cell block at the Altiplano Federal Prison that led to a lighted and ventilated tunnel nearly a mile long. Guzman previously escaped from prison in 2001 in a laundry cart and eluded authorities for more than a dozen years until his capture in 2014, when he was arrested in a hotel in the Pacific beach town of Mazatlan, in his home state of Sinaloa. September 6, 2015 - A group of international experts say there's no evidence to support the Mexican government's claim that the 43 students who went missing last year were burned at a landfill. Attorney General Arely Gomez Gonzalez says after the report is released that Mexico will launch a new investigation at the landfill site. September 19, 2015 - Mexican authorities have arrested 13 more suspects in connection with "El Chapo" Guzman's prison break, including three high officials from the federal prison system, sources close to the attorney general's offices say. That's in addition to the seven prison workers charged in connection with the escape almost a week after it happened. It is sad that many people have died on the Mexican drug war but I think Felipe Calderon did the right thing to fight the drug Cartels. I estimate mr guzman will have control of all plazas in early February 2016.. arriba el chapo y Toda su gente, atte. El morroñis de la palma navolato, sinaloa ajuuaa. so how did you come to that conclusion? please don't say you just know. 10:43 Is just a silly sinaloa groopie who just makes stupid comments that have no sence. Just talking nonsence all the time. Dumb kid, grow up. The reason Chapó lost Juarez was because when he went to jail most of his lieutenant's jumped sides to NCDJ. Now that he's out those same people are trying to jump back into the Sinaloa Cartel, before he was arrested he had majority control of Juarez. I heard rumors that Z-40 is trying to bust out of prison like el chapo did. I dont know how or when but if he does get out chapo and mencho will have a big problems again. Z 40 is a game changer and with him out and at large the zetas will be looking to get their top spot back. Man, Z-40 lost his mojo a long time ago. He doesn't have any clout. 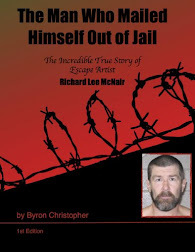 Whether in jail or roaming the back roads of Mexico like he was known for, he isn't a threat. The Los Zetas are hanging on by a thread. They are no longer as powerful as they once were. With or without Z-40, the Z's are at the end of the road. Just a splintered group, once powerful cartel, turned into pockets of street gangs still cutting off heads of women like cowards. Sinaloa is toting the mail in Mexico now. Better believe it. Z40 has the people to break out. and he still weilds a great amount of power. he got that one informant killed not to long ago. and not to mention Z40 was behind bars when that informant was killed. so he has plenty of power STILL. and the zetas are far from be finished. trust me. i have 3 family members with the gulf cartel and all admit Z40 was and still is a force and all admit the zetas are not done yet. why cause he got out of jail? why didnt he do it before? go watch cartoons!! Que desmadre....is sad to see all this...I remember 2009 ,2010 and now the same...we need a real form of goverment. They missed cjng formally known as cartel del milenio now based on jalisco state before based on michoacan . Nop not at all. Valentin Elizarde has nothing to do with the opening of the War. No one know for real why he was killed. 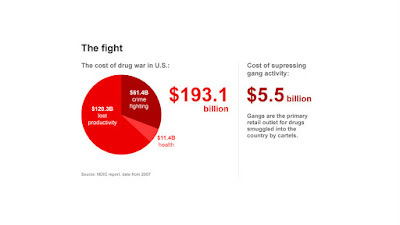 The war between the cartels is about bad blood not about songs and music. The main FACT: Mexico Government is losing the war! El Chapo la calavera caminando. This is a dead person walking. Pablo Escobar thought he was untouchable. No one wants El Chapo to stay alive. He is a rabbit with teeth in a mundo con lobos with even bigger teeth. Suerte conejo. I want el chapo to stay alI've #alllivesmatter....including el chapo . So go fk yourself bro . I want Chapo to stay alive too. I want Chapo to live forever. He's a folk hero. Me estas vacilando ? He has risen from poverty to power, the dream of the people. By whatever mean ?. He's "a"top ten player in the world's economy. Forbes has recognized him..
El chapo lo van ah matar oh lo van agarrar antes de julio del año Q entra... El save mucho del gobierno mexicano si Los gringos lo agarran va sueltar toda lo sopa so el gobierno Mexicano lo suelto pa poder matarlo. De ami se acuerdan..
Can you please write comments in English..?! Or at least use Google Translator and then copy/paste whatever you wanna say. That would help a lot of us in here that is not speaking Spanish natively. I find it hard to believe that Mexico is the main supplier of marijuana for the United States. I imagine that US is the main supplier of marijuana for the US. The common folk can't afford the high dollar USA hydro, and the mexican swag fills the gap, a large gap. Many fish in the ocean some big some small all shapes and sizes. Will they ever disappear? September 29, 2015 - Former Special Forces Operative Paco Cerda and the Saltillo Cartel burst onto the scene. Transporting metric tons of cocaine and high quality marijuana into the United States anonymously. Paco Cerda trabajó para Cartel de Sinaloa? They forgot about mysterious disappearance of the Chapo Snitched Guy. He hasn't been heard from for a couple of months. Send your crimestoppers tips to Otis or Chivis. We have to find him.